The next iPhone could force its users to to use only USB-IF certified chargers if they want to enable fast charging on their smartphone, a report claims, with uncertified and potentially hazardous chargers limited to charging at a far slower rate. A future model of iPhone may include support for "C-AUTH," a USB Type-C authentication specification that can verify if connected cables and chargers are certified accessories, reports Macotakara. 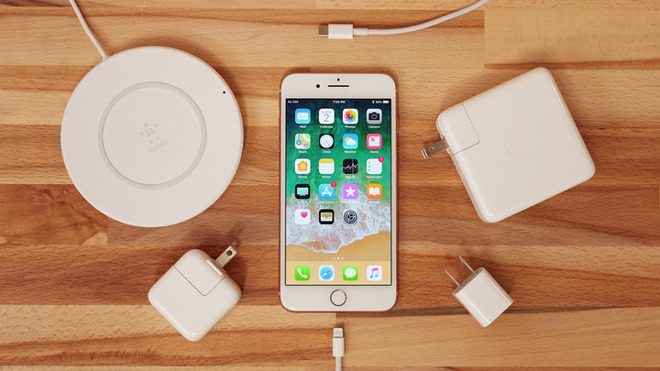 If true, this will mean anyone who wants to charge their iPhone at the fastest rate will need to buy either official chargers or third-party USB-C chargers that have received the relevant USB PD 3.0 standard certification. Created by the USB Implementers Forum, which counts Apple as a member, C-AUTH is a system for hardware to cryptographically verify certifications and hardware identities. This has a number of uses, such as helping secure enterprise networks, by potentially allowing only specific devices to connect to each other, and preventing man-in-the-middle attacks. For consumers, C-AUTH aims to help reduce the number of instances where faulty or poorly constructed chargers or cables can cause damage to devices. By authenticating chargers, the device can confirm it is safe to operate, enabling features like Power Delivery 3.0. Existing Apple products are capable of connecting to a USB-C charger using a Lightning-to-USB-C cable, enabling fast charging using a 15-Watt power supply. The current implementation also allows for third-party chargers to provide fast-charging, but with relatively few safety checks in place to prevent a potentially hazardous charger from being used for it. Under the USB PD 3.0 standard, if the charger fails to authenticate via C-AUTH, fast charging at 18 Watts will not be enabled. Instead, the charger will be forced to provide power at or below 2.5 Watts, enabling it to be used for charging, but not at a fast-charging rate. The C-AUTH protocol was announced in January 2018. It has since spread to many third-party manufacturers' products, and is readily available. As a member of the USB Implementers Forum, it is highly likely that Apple will apply standards and practices that are created by the group into its products, making its appearance in future iOS devices quite probable. It is also possible it could make an appearance in the fall iPhone refresh, with assorted rumors suggesting an 18-Watt USB-C wall charger may be bundled with this year's devices.